Our wonderful neighbors, J&W, offered to host us at their house for our last night. We had a fun dinner with some other friends who stopped by and then Matt and I went back to the house to sort out the sailing stuff and get it packed up. We worked until 12:30 am and then went to J&W’s house to crash (it made me wonder why adults don’t have sleepovers more often. They’re a lot of fun!). We got up in the morning and still had a lot of trips to make to empty things into a dumpster, take out recycling, make a trip to the storage unit to drop off everything that ended up not going into the sailing pile, etc. so as not to leave anything for the new owners. 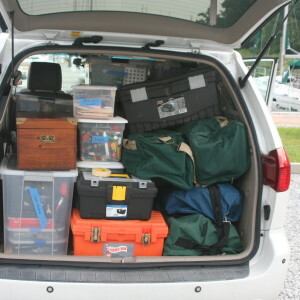 Until all of this was done, we really couldn’t pack everything into the two mini-vans. I don’t know how Matt did it but he configured them like a puzzle and got everything to fit. We literally left the house 58 minutes before the new owners were due to arrive. Not exactly the relaxed exit I had envisioned. 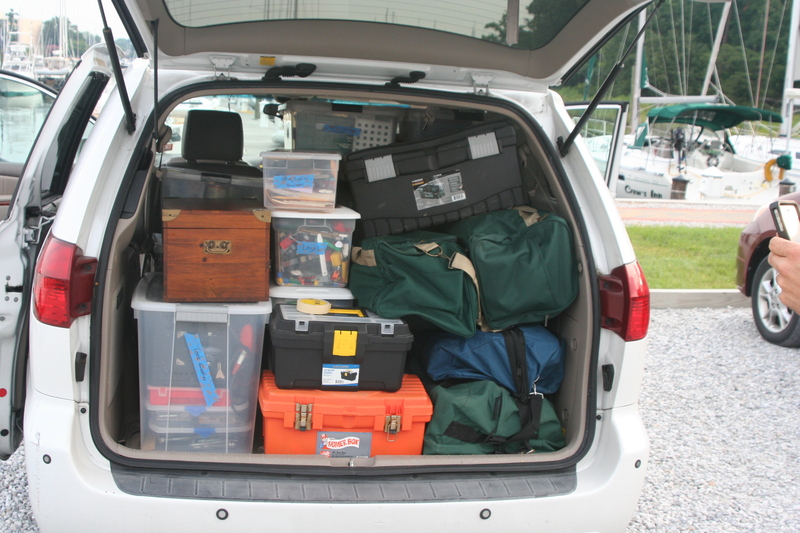 We then had to drive to my pottery co-op, pack up all my stuff there into boxes, unpack part of one of the vans, and load all of the pottery boxes. The boys and I sat on all the stuff (watching a Dr. Seuss video) while Matt took everything to the storage unit. About three hours later, we then re-loaded the van and were on our way out (after making stops on our way out of Cleveland to say goodbye to two significant others in our life). We were all so exhausted that Joshua fell asleep about 8 minutes into the trip. I called Matt and said I could only make it about 1.5 hours and that we’d need to stay in a hotel. I was literally being fueled by caffeine and chocolate for the previous two weeks and was about to crash. We are hoping this is the storm before the calm. This entry was posted in Packing Up, Planning on August 11, 2013 by Diane.